In the last JailMedicine post, I discussed the use of NSAIDS for pain. Pain management is probably accounts for 90+% of NSAID prescriptions in primary care. Oftentimes, though, we delude ourselves into thinking that we are also treating inflammation. Usually we are not and that is the subject of today’s post. To show why, we have to delve into the NSAID inflammatory effect. How NSAIDS act to affect the inflammatory response is well known (unlike their pain effect, which is still a mystery). All practitioners should know the basics of how NSAIDS work. This is essential knowledge for rational prescribing. NSAIDS affect inflammation by inhibiting the functioning of Cyclooxygenase enzymes (called “COX” enzymes for short). The various COX enzymes produce a bunch of proteins, collectively called prostaglandins. The two main COX enzymes are named (boringly—that’s the best we got?) COX-1 and COX-2. The similarity of their names is misleading since, they have VERY different roles. COX-1 enzymes are part of our normal, everyday physiology. COX-1 enzymes are active all the time. This is important! The prostaglandins COX-1 enzymes produce do many good things. For example, the COX-1 prostaglandins promote blood flow to the kidneys. That’s good—most doctors are in favor of blood flowing to the kidneys. Other COX-1 prostaglandins protect the stomach lining against gastric acid. Most also consider this to be pretty beneficial. Still other prostaglandins promote platelet aggregation. There are many other prostaglandin effects, but I want to focus on these three. Unlike COX-1, COX-2 enzymes are only active at the time of an acute injury, such as a sprained ankle. The COX-2 prostaglandins released at the time of injury promote the events that we usually associate with inflammation, such as increased blood flow to the injured area and increased capillary leakiness which result in redness and swelling. COX-2 prostaglandins also stimulate pain receptors. Finally (and this is important), COX-2 prostaglandins decrease platelet aggregation. Notice that the COX-2 effect on platelets and bleeding is just the opposite of the COX-1 effect. All of the NSAIDS we use inhibit both COX-1 and COX-2 functions, but to a variable degree. Some NSAIDS have more of an effect on COX-2 enzymes, and some have more of an effect on COX-1. Which COX enzyme a particular NSAID preferentially targets determines which toxic effects the NSAID may have. The NSAIDs that target COX-1 cause decreased renal blood flow which tends to result in increased blood pressure. COX-1 NSAIDs also decrease gastric protection which can result in GI ulcers and bleeding. The NSAIDs that are more COX-2 preferential have less propensity for these side effects but because of their effect on platelets, increase the risk of heart attacks and stroke. Remember that there is a ceiling for the pain-relieving effects of NSAIDS, probably because NSAIDS are acting at a different site to exert their pain-relieving effects. However, there is no ceiling for anti-prostaglandin effects of the NDAIDS. The more you give, the more effect they have. But remember that many of these effects are bad. The more NSAIDS you give, the more you inhibit renal blood flow. 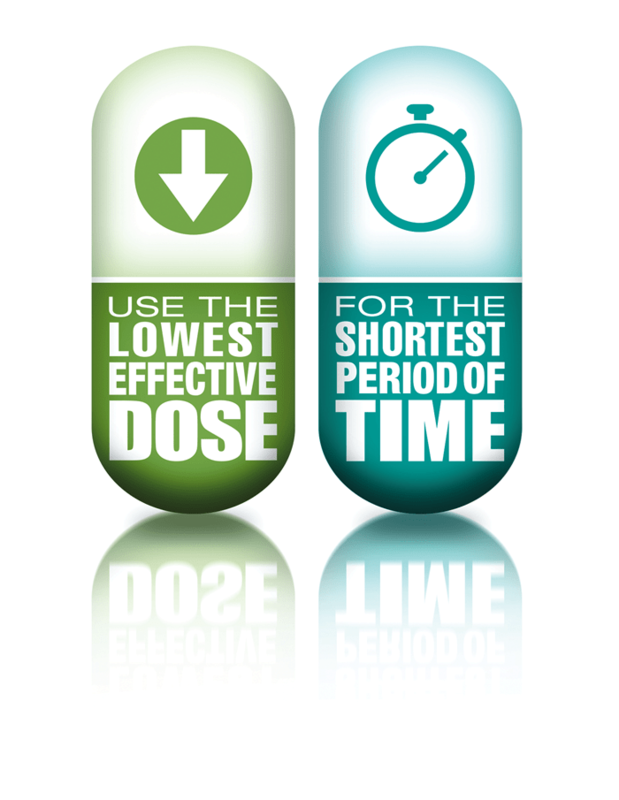 The bigger the dose of NSAIDs, the more you remove gastric protection from the stomach. If you are giving NSAIDs as a pain reliever, this makes no sense. A big dose of ibuprofen, say, gives no more pain relief to your patient but does decrease their renal blood flow more and does remove their gastric protection more. 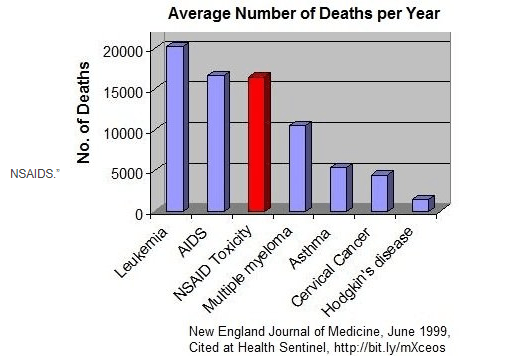 So why in the world would we want to give big doses when we can only harm most of our patients by doing so? Well, in fact there are medical indications for big prostaglandin-busting doses of NSAIDS, in which the benefit may exceed the harms. We don’t want to interfere with normal prostaglandin production—but we do want to intercede when prostaglandin production is abnormal. Let’s call this “pathologic inflammation.” There are five clinical instances of pathological inflammation when big doses of NSAIDS will help our patients. All clinicians should know this list! That’s it! Those are the five conditions in which big anti-inflammatory doses of NSAIDs will help your patient. Notice that four of the five are acute events that are limited in time. The only one that where it makes sense to prescribe large doses of NSAIDs long term is autoimmune arthritis. Unless your patient has RA, they get no benefit from 800mg of Motrin scheduled three times a day forever. 1. Acute strains and sprains. For these conditions, the potential harms of high dose NSAIDS outweigh any potential benefit in most patients. Also, patients who have osteoarthritis and chronic back pain tend to be older and with more co-morbid conditions. These are the very patients who are at highest risk of being harmed by disruption of their normal prostaglandin processes. Use lower, pain relieving doses of NSAIDS on a prn basis—or else use acetaminophen. As always, what I have published here is my opinion, based on my own training research and experience. Feel free to disagree—I could be wrong! This entry was posted in Uncategorized on July 11, 2018 by Jeffrey Keller MD. I’ve used them, NSAIDS, myself for pain for short times; and they work! Isn’t that the bottom line?? ?